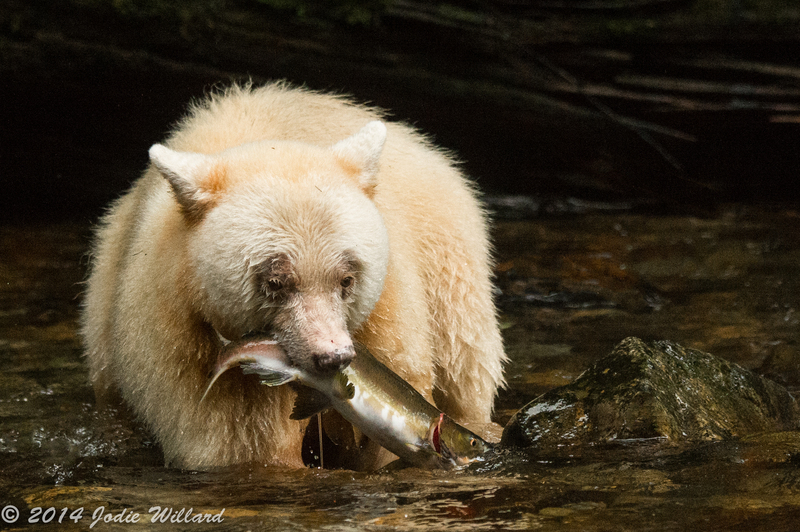 Explore the secret world of the Spirit Bears in the Great Bear Rain Forest. 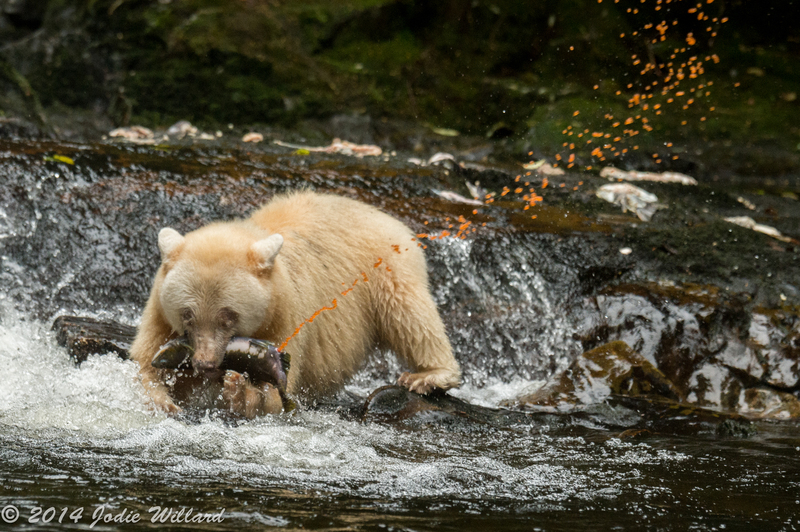 Only 6 participants will join in the unparalleled opportunities to photograph the bears up close while they fish along a steam teaming with spawning salmon. The Spirit Bears of the great bear rain forest, also known as the Kermode bear is a rare subspecies of the American Black bear living in the British Columbia. No one can agree on the exact number of spirit bears but the best estimate is fewer then 500 individuals. The is a unique opportunity to work with the best guides and bear viewing locations available for Spirit Bears. I offer a very small group size to view the spirit bears a total of 6 people. We will have the unique opportunity to work directly with the founding spirit bear guide Marven Robinson and we will stay right in the community of which he lives. Each day we will head out in the early in the am and return in the evening, giving us the most possible viewing time. Marven Robinson is the most knowledgeable Spirit Bear viewing guide in Brisith Columbia, and has been guiding to the bears for over twenty years. Marven also known as the “Spirit Bear whisperer” is a Gitga’at Guardian Watchmen, who has worked tirelessly to protect the Great Bear Rain Forest as well as the Spirit Bears. Marven was the guide for the National geographic feature story on Spirit Bears leading Paul Nickleon. Marven’s primary goal is to protect the safety and well being of the bears as well as his guests, so we are in good hands working with his premier guiding skills and expertise. Marven and I have been working together for 5 years now, each year out doing the last, our goal is to provide our guest with the most viewing opportunities available, while learning about bear behavior, the great bear rainforest and the rich culture of the Gitga’at people of Hartley Bay British Columbia. Each day we will travel to an island in the Douglas Channel in the heart of the Great Bear Rainforest, via an enclosed steel fishing boat that has been outfitted for passengers. Upon arrival we will disembark off of the front end of the boat on to the shore, then we make our way to trails along the creek filled with spawning Salmon. Each trail is about a 15 – 20 minute walk as we work our way through the rain forest, some points crossing the a small streams or climbing over large fallen trees, up small inclines. Once we arrive we get situated along the bank of the creek or if you choose in an unobtrusive wooden platform. Not every location has platforms so plan on most of your shooting along the creeks bank. You can choose to photograph from the side of the creek or from the platform. As I mentioned we are a small group, but you will see other people located on the river, each group has a location separate from the other group, Marven does a great job keeping people separate as the bear passes by. We will be staying in Hartley Bay in a new bunk house designed and built by Marven Robinson himself. The accommodations are new with spacious double occupancy bedroom with large double beds. These accommodations are shared bathrooms. We do have a person that comes and cooks dinner every night and a packed lunch is provided. Breakfast we cook on our own. The will be Internet available. At little bit about Hartley Bay: It’s a very small community with a population of Gitga’at First Nation people of around 200. The Gitga’at people are very friendly and welcoming. There are no roads in Hartley Bay only boardwalks. You can walk the entire town in about 15 minutes. A small percentage of the local people use all-terrain vehicles to get around but walking is the primary mode of transportation. Very few outsiders come here due to the remote location of the community. There is a small harbor where every so often a boat will arrive to refuel. Physical Rating is Moderate /Flexible must be able to get on and off a boat. There is hiking through the rain forest along a creek/stream. There will be obstacles such trees the have fallen that we will work around. The walk on average is about 15 – 20 mins inland on a trail. Most be in good health and have a certain amount of agility. Terrain can be slippery and rocky in some areas. A positive attitude and open mind for this adventure will serve you well. All wild animals can be unpredictable in nature and can cause injury. The daily activities will be subject to weather including wind and tides we will work within safety parameters set by Marven, our goal main to work in a safe manner. You will need to arrive in Prince Rupert the day before your trip begins. Sept 14th (earlier if you prefer) for the Sept 14 th am departure date. 8:30 am – Depart from Prince Rupert for Hartley Bay by ferry. The four-hour ferry trip provides a first glimpse of this beautiful landscape from the water. After arriving in Hartley Bay, we will quickly get settled in the guesthouse, pack a lunch and head out for the afternoon and early evening in search of spirit bears. Each morning (usually around 7 am) we will meet down at the dock for departure to the spirit bear location, which is about a 30 min boat ride. To maximize our chances of viewing the bears Marven will brief us as to which location we will be going. He will make this decision based on weather and his assistants providing current bear behavior. 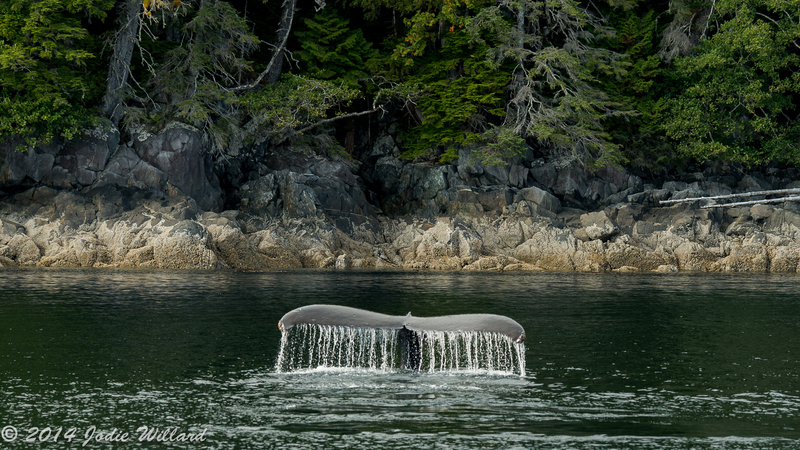 There will be many opportunities to photograph wildlife during the boat ride, primarily whales breeching and bubble feeding. After breakfast and packing up, guests can choose to accompany their guide on a hike to a nearby lake and/or a trip to view the local Gitga’at Cultural Centre. 12:30 pm: Guests depart by ferry for Prince Rupert. There will be enough time to get something to eat before heading to the airport. 8:00 pm: Most guests choose this Air Canada flight to Vancouver. Others stay in Prince Rupert for another day at their discretion. The workshops boasts the smallest group size available with most viewing time per day. You will arrive first thing in the morning and leave later afternoon. Credit card processed through PayPal, *4% fee will be added. A mandatory comprehensive Travel Insurance Policy must cover clients before joining tour, including Trip Cancellation Coverage. This policy must include adequate cover for baggage loss, medical expenses, should the client be too ill to continue on the tour, insurance must include air ambulance, flying doctor, or helicopter rescues.